PDF Max is a desktop class PDF app for reading, annotating or signing PDF documents on your iPhone/iPad. Mark up documents with highlights and handwriting, insert texts and stamps, fill out, sign PDFs and even manipulate PDF pages. With over 3 million downloads across platforms, PDF Max helps hundred thousands of people over the world to go paperless everyday. - Smooth vertical scrolling - allow you to scroll through your entire PDF document smoothly and efficiency. - Open documents in multiple tabs. - Multi-purpose SideBar includes everything you need to skim through your documents like never before: Page Thumbnails, PDF Outlines/Bookmarks, Annotation List & Search Panel. - Smart Zoom: Double-tap on text blocks and PDF Max will zoom the touched text block to fit the screen. Simple & efficient reading. - Unlimited threaded comments (notes) attached to any annotation. - Create VOICE ANNOTATIONS: Record and embed voice annotations within the PDF document. - Save and organize your favorite tools and access them quickly when needed. - Smart caching mechanism to avoid data loss. - The all-new file manager with Thumbnail View, List View modes. Sort by Name, Modified Date or Size. - Seamless, desktop-like integration with Dropbox or Google Drive. Work both with or without an Internet connection. - Rename, Copy or Move remote files/folders. - Local Library for organizing files from different sources. - Copy/Move files or folders between online cloud storage services. 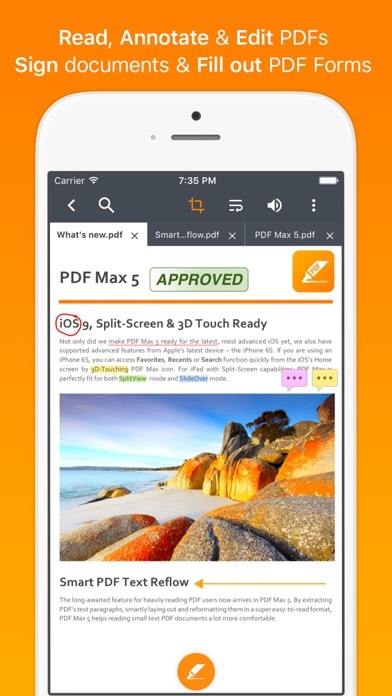 3 million downloads, 6 years in development makes PDF Max the world’s most popular mobile PDF app!